Dr. Tasky is dedicated to providing the best care to his patients. They can expect a friendly, professional atmosphere, awareness of their needs, and a willingness to go the extra mile for their health. Brian Tasky, DC received his degree as a Doctor of Chiropractic from Northwestern Health Sciences University in Bloomington, MN in 2005. He is board certified in chiropractic and physiotherapy and acupuncture. Following his internships in the Minneapolis area, Dr. Tasky practiced for 2 years in the Pike Lake area just North of Duluth, MN. He opened Miller Hill Chiropractic in February 2008. Dr. Tasky is trained to treat many types of conditions. He has taken extensive coursework on rehabilitation, nutrition, wellness care, and advanced treatment techniques. Dr. Tasky is actively involved in the community. He is an active member of the Skyline Rotary Club, working to improve our community. 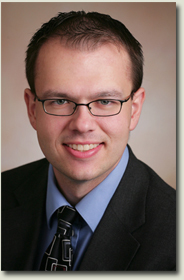 He is also a member of the Hermantown Area Chamber of Commerce.